Time is a tight commodity for clinicians, and the personalization tools offered on the new Medtelligence website make it easier for clinicians to find content that suits their specific needs and interests. Medtelligence, the newest member of the US HealthConnect Inc. (USH) group of CME companies, today announced the launch of its new digital learning platform. The website presents a unique suite of digital learning tools, personalized education, and a customized user experience. The site also allows users to select their preferred learning format on every program--including options of audio, video, text, or slides. USH is a global organization whose subsidiaries are dedicated to improving the lives of patients and healthcare professionals through evidence-based education for clinicians. USH companies develop, produce, distribute, and measure the impact of education designed to improve the practice of medicine. 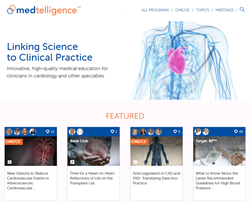 CME subsidiaries include Omnia Education, a global leader in healthcare education for women’s health providers; Prova Education, experts in adult professional learning in oncology, primary care, cardiology, auto-immune diseases, and many more clinical areas; Medtelligence, a leader in cardiovascular and related education; and AGILE, the Academy for Global Interprofessional Learning and Education, a Europe-based company offering education in multiple languages to healthcare professionals across the globe.